From the days of a few business houses controlling the economic and industrial activities of the country, we have come a long way. The liberalization of the economy in 1991 and the ensuing economic reforms saw the sprouting of several standalone family businesses. The Indian family businesses have adapted well to the changing business environment and continue to contribute to the country’s economy in a big way. When India became independent in 1947, few business ‘houses’ like the Tatas, the Birlas, the Mafatlals and the Walchands had substantial controlling power on the entire economy, due to their sound financial position and diverse activities. Though, none of them had a monopoly in any industry (Chaudhuri, 1972). The period from 1947 to 1990 was characterized by high tariff rates, restrictions on imports, foreign exchange, private and foreign investments, a creation of state-led monopolies and nationalization of banking and insurance sectors (Kotwal, Ramaswami, & Wadhwa, 2011). Prior to 1991, the private sector in India was predominantly controlled by ‘business groups’ in spite of all the restrictions and regulations that existed. This period lasted till 1990, after which the government was forced to liberalize the Indian economy due to a balance of payments crisis. Widespread economic reforms in 1991 were expected to bring about significant transformations in the structure, operations, investments and competitiveness of the businesses in India. Many sectors that were earlier reserved only for the public sector, such as telecommunications, power generation and distribution, mining and airlines, were opened up for private players. A new wave of entrepreneurial ventures, in traditional as well as new sunshine industries, emerged post-1991. Norms were also relaxed for foreign multinational companies to set up businesses in India. There were widespread apprehensions about the capabilities of Indian private sector (predominantly family-controlled businesses) to withstand the pressure of the newly created “freedom”. The overall effect of liberalization, on the economy, was very encouraging. The GDP growth rate that averaged a mere 3.5% from 1950 to 1980 averaged 7.4% from 2001-2010 (Table 1). India became one of the fastest growing economies in the world. Yet, business houses such as the Thapar, Mafatlal, Lalbhai, Shriram (DCM) and Shah (Mukand) which were amongst the top 50 business houses in the country at the beginning of the 1990s lost out to the new entrepreneurial ventures, of families like Adani, Reddy (Dr Reddy’s), Mittal (Bharti) and Shanghvi (Sun Pharma). Other top business houses like Tata, Birla, Ambani (Reliance), Bajaj and Mahindra had to reinvent themselves to stay relevant and on top. Twenty-five years after liberalization, time is ripe to study the evolution of family businesses post liberalization. 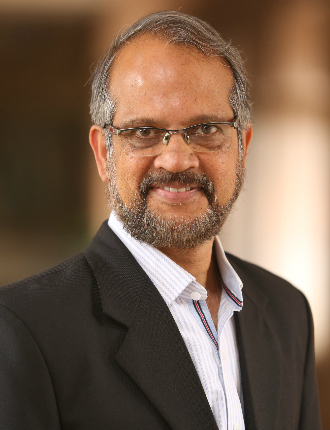 This article captures the highlights of a study to systematically map the evolution, growth, and transformation of businesses listed on the Bombay Stock Exchange (BSE) and the National Stock Exchange (NSE) of India, over a period of 26 years (1990-2015). Using data for 4,809 listed firms from Prowess, we study family businesses, heterogeneity within them, while also comparing and contrasting them with other ownership categories. A new wave of entrepreneurial ventures, in traditional as well as new sunshine industries emerged post- 1991. Norms were also relaxed for foreign multinational companies to set up businesses in India. 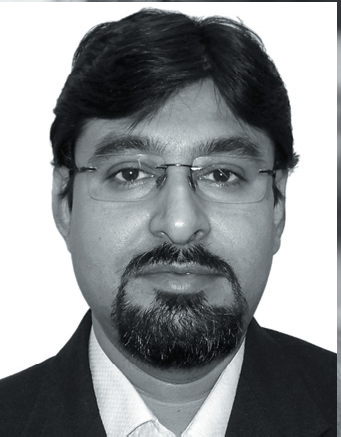 Businesses in India are characterised by differing ownership structures. Based on their shareholding and management control, the data was classified into two categories: Family Businesses (FBs) and Non- Family Businesses (NFBs). Family businesses were further classified into Family Business Group Affiliated Firms (FBGFs) and Standalone Family Firms (SFFs) and NFBs were further classified into State-owned enterprises (SOEs), Multinational subsidiaries (MNCs), Other Business Group Affiliated Firms (OBGFs) and standalone Non-family Firms(NFFs) (Exhibits 1a and 1b). The concentration of ownership in the hands of the promoters is highest in state-owned enterprises, followed by multinational companies. The average promoter holding in both business group affiliated family firms and standalone family firms has gone up since 1990 (Exhibit 2a). In business group affiliated family firms, the preferred mode to hold shares is through other holding companies, while in standalone family firms the family members prefer to hold shares directly as individuals or Hindu Undivided Family (HUF) (Exhibit 2b). The process of liberalization began without much fanfare by the late 1970s. Significant reforms in the late 1970s and through 1980s included relaxation of import-export regulations, delicensing of various industries and a more effective real exchange rate management. In this backdrop, there was a wave of entrepreneurs who wanted to take advantage of the early sets of reforms and we saw a large number of family firms getting incorporated in the early 1980s. Similarly, when the next wave of more big bang reforms was introduced in 1991, we observed a further wave of firm incorporations. The concentration of ownership in the hands of the promoters is highest in state owned enterprises, followed by multinational companies. 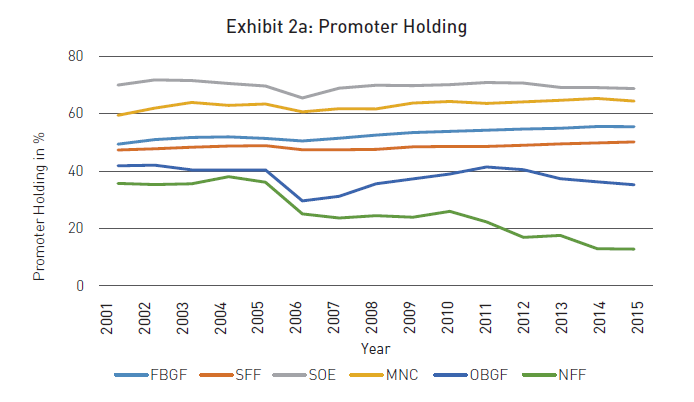 The average promoter holding in both business group affi liated family firms and standalone family firms has gone up since 1990. 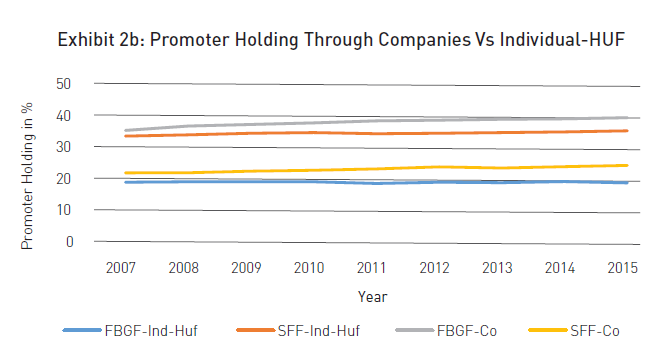 Note: FBGF-Ind-Huf refers to Individual and Hindu Undivided Family holdings of FBGFs; SFF-Ind-HUF refers to Individual and Hindu Undivided Family holdings of SFFs; FBGF-Co refers to promoter shareholding percent in FBGFs through other companies; SFF-Co refers to promoter shareholding percent in SFFs through other companies. The growth in the number of standalone family fi rms was driven primarily by the new fi rms in the services sector. Rate of listing of standalone family fi rms was higher in the services sector. While the business group affiliated firms did take advantage of the reforms, it was the standalone family firms that emerged as the single largest ownership category in terms of number of firms that were listed on the BSE and NSE (Exhibit 3a). Only 15% of the listed standalone family fi rms were incorporated prior to 1981. In comparison, 40% of the listed business group affi liated family fi rms were incorporated in the 118 year period in between 1863 to 1980. Close to 73% of the listed standalone family firms were incorporated in the period 1981 to 1995. In comparison, only 49% of the business group affiliated family firms were incorporated in the period 1981 to 1995. The percent of firms incorporated post 1995 was similar for both types of family firms, at around 11-12%. The growth in the number of standalone family firms was driven primarily by the new firms in the services sector (Exhibit 3b). Rate of listing of standalone family firms was higher in the services sector, as is evident from the higher Cumulative Annual Growth Rate (CAGR) of 14.1% for the number of listed firms in our sample. In comparison, the CAGR in the manufacturing sector was only 5.8%. Wholesale trade, financial services and computer programming were the most favored industries for the listed standalone family firms. This is reminiscent of the rising contribution of the services sector to the GDP. The listed standalone family firms were younger than the business group affiliated firms (Exhibit 3c). Family firms in our sample that were incorporated prior to the 1980s had a greater propensity to create business groups by creating more firms. The trend seems to have changed in the last three to four decades. More and more family firms are now standalone firms. This could be because in the pre reforms era, multiple firms were created to bypass the quota system, and obtain licenses. That is no longer required. The average age of business group affiliated family firms in our sample was 38.44 years while that of standalone family firms is 28.73 years. More than 50% of the standalone family firms are less than 30 years of age. The first generation founder would still be actively involved in most of these companies considering the average age at which entrepreneurs start a firm to be 40 (Wadhwa, Aggarwal, Holly, & Salkever, 2009) and the average tenure of the founders to be 24 years (Beckhard & Dye, Jr., 1983), but many of them must be staring at a change of guard in the near future. 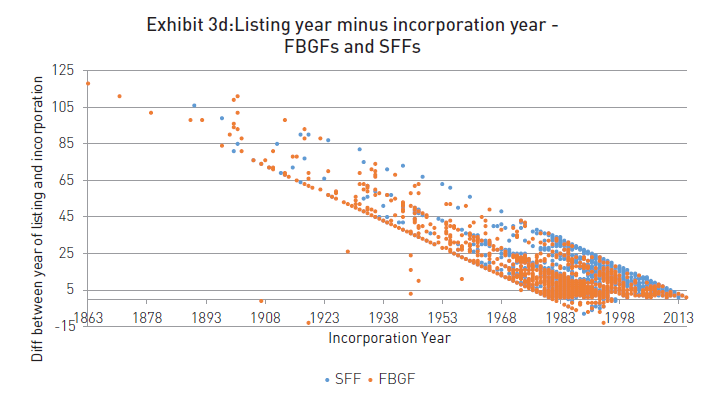 The average difference between the listing year and the incorporation year for business group affiliated family firms was 14.76 years, whereas for standalone family firms it was 10.01 years (Exhibit 3d). The standalone family firms were probably forced to list earlier compared to those affiliated with business groups due to the capital constraints and limited sources of financing. In comparison, the business group affiliated family firms allowed the firms in their group to grow to a certain size with capital from their internal markets before exposing them to external capital markets. The services sector accounted for more than 90% of the total assets of Non-family businesses. This reflects the growing number of firms in the services sector and the importance of the services sector in the Indian economy. In FY 1990, the services sector accounted for about 45% of the GDP of India while in FY 2015, its contribution was close to 60%. Services sector not only attracted more foreign direct investment but also gave higher valuations upon listing. More and more family fi rms are now standalone fi rms. This could be because in the pre reforms era, multiple firms were created to bypass the quota system, and obtain licenses. That is no longer required. For the family businesses, manufacturing and services contributed almost equally to the Total Assets. For multinational companies, services sector accounted for just 18% of the Total Assets. 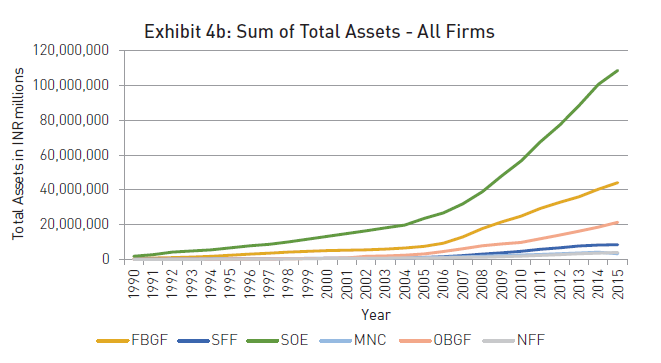 The total assets of other business group affiliated firms and standalone non-family firms had the highest overall CAGR for the period 1990-2015. This was mainly due to their high growth rate in the services sector. In manufacturing, family businesses (both standalone and group affiliated) had the highest growth and the propensity to create total assets. Standalone family firms were the fastest growing category in services (Exhibit 4a). The average Total Assets is highest for state owned enterprises, followed by business group affiliated family firms and then the other business group affiliated firms. 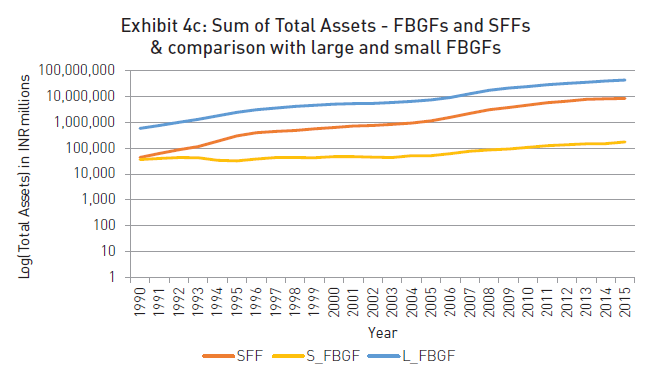 While standalone family firms are large in number [of fi rms], they are smaller in size as evident from the low total assets (Exhibit 4b). Smaller business group affiliated family firms have grown at a much slower pace compared to the overall business group affiliated family firms. The smaller business group affi liated family fi rms have not benefi tted from the advantages that are typically associated with group affi liation. The standalone family firms were able to grow in spite of not having the resources available to a group affiliated firm. The gap between total assets of standalone family firms and small business group affiliated family firms has been increasing over time suggesting that the effect of group affiliation has not been positive for the smaller business group affiliated family firms. In spite of the opening up of the economy and increased competition family firms grew in the post-liberalization era. They retained their entrepreneurial spirit by entering into new sunshine industries. Many standalone family firms were incorporated and subsequently listed to access funds through the capital markets. Family firms, especially business group affiliated family firms, led the way in creating more assets, especially in the manufacturing sector. Promoter families seem to have recognized the long-term benefits of reinvesting in their family business. This is reflected in them increasing their holdings in family firms over the years. This also indicates the clarity these families have about not only the strategic direction but also of the internal capabilities to build further, together. It needs to be seen if the family businesses, especially the ones that are at the crossroad to either transition to the next generation or are on the cusp of making non-family professionals their agents, survive the change. Succession remains the number one concern of most family businesses (Chua, Chrisman, & Sharma, 2003) and rightly so, as in Europe and the United States, succession challenges have contributed to the short life of the majority of family firms. It was found that there is a lot of heterogeneity within the family firms. Business group affiliated family firms and standalone family firms displayed different characteristics in many aspects. Standalone family firms played an important role in the development of the services sector in the country. Similarly, large and small business group affiliated family firms displayed different characteristics. Our analysis puts to rest the doubts, and reinforces that family businesses are not just the past, they are the future and an integral part of the journey of India to become an economic powerhouse. Their capacity to transcend time is their greatest strength (Aronoff & Ward, 1995). Family businesses have retained their entrepreneurial spirit and adapted to the changing business environment. Family businesses were traditionally strong in manufacturing but they have shown an equal penchant for the services sector, when the opportunities arose. Many of the family businesses, especially the standalone firms, are staring at a change of guard in the near future. The promoter holdings in family firms have gone up over the years, indicating the confidence of the promoter family in the business. There is a lot of heterogeneity within the family firms. Aronoff, C., & Ward, J. (1995). Family-Owned Businesses: A Thing of the Past or a Model for the Future? Family Business Review, 8(2), 121-130. Beckhard, R., & Dye, Jr., W. G. (1983, Summer). Managing Continuity in the Family-Owned Business. Organizational Dynamics, 5-12. Chaudhuri, A. (1972, December). Industrial Licencing Policy and Prevention of Concentration of Economic Power in India- A Critical Review. Artha Vijnana, 14,333-373. Relationship with Nonfamily Managers. Family Business Review, XVI(2), 89-107. Kotwal, A., Ramaswami, B., & Wadhwa, W. (2011, December). Economic Liberalization and Indian Economic Growth: What’s the Evidence? Journal of Economic Literature, 49(4), 1152-1199. Wadhwa, V., Aggarwal, R., Holly, K. Z., & Salkever, A. (2009). The Anatomy of an Entrepreneur- Family background and motivation. Kansas City, USA: Kauffman Foundation. 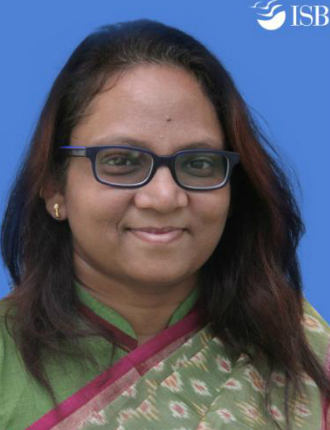 Sougata Ray is a Professor of Strategic Management at the Indian Institute of Management, Calcutta.